Show Racism the Red Card is an anti-racism educational charity established in 1996. We work in schools throughout England, Scotland and Wales delivering anti-racism workshops to more than 50,000 young people every year and in many local authority areas we are funded to do this free of charge. 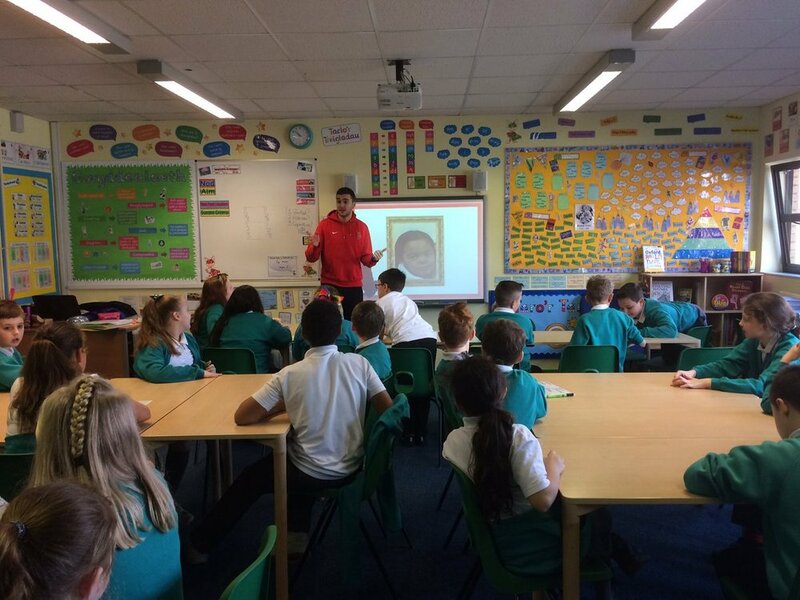 Our team of educators and ex-professional football players can visit your school for a whole day educating young people from year 5 up to year 13 against racism. To enquire about booking a workshop in your area click on the buttons below or to contact one of our offices click Here. To educate young people about the causes and consequences of racism and to explore the various forms racism can take. To empower young people to challenge racism in the communities in which they live, providing them with relevant knowledge and information to enable them to do this. To help young people prepare to play an active role as citizens in an increasingly multi-cultural society. To enable young people to develop good relationships and respect the differences between people, regardless of their ethnicity, faith, culture or nationality. Our educational film and guidance are sent to the school ahead of the visit to allow students to undertake preparatory activities. Schools also return a pro-forma to highlight any particular issues that they wish to be covered. Our workshops are fully participatory and interactive. Students take part in a range of visual, auditory and kinaesthetic activities designed to build empathy and understanding and to encourage discussion and critical thinking. Participants work independently and in groups to fully explore the issues. Initial workshops provide an introduction to the subject of racism. Workshops focus on the following: Anti-Muslim hatred, anti-Immigrant sentiment, racism toward Black and other minority groups and anti-gypsyism. Please note that our workshops are suitable for both primary, secondary and special needs provision and content is tailored accordingly. .‘Football and Fitness’ sessions can also be delivered alongside the classroom workshops by ex-professional footballers. The sessions take place in mixed groups with an emphasis on teamwork and supporting each other. Young people wear Show Racism the Red Card bibs and prizes are given out for enthusiasm and participation. We have found that the football sessions and presence of ex-professional footballers increases the enjoyment and participation of the young people and their engagement with the anti-racism message. Copies of our educational films and resources are provided to the school to allow teachers to continue working around the theme of combating racism and racist bullying. The education pack contains 21 pages of activities and discussion points proven to stimulate debate and promote understanding, complete with learning outcomes, age group suitability and curriculum links. As our workshops involve participation and discussion we prefer to work with individual classes and visit a school for a whole day; however we are happy to speak at a whole school assembly in addition to this if appropriate. This format is flexible as we look to tailor our work to the needs of the school, please contact us to discuss your requirements. Read what other schools have had to say about our workshops in the workshop testimonials page.